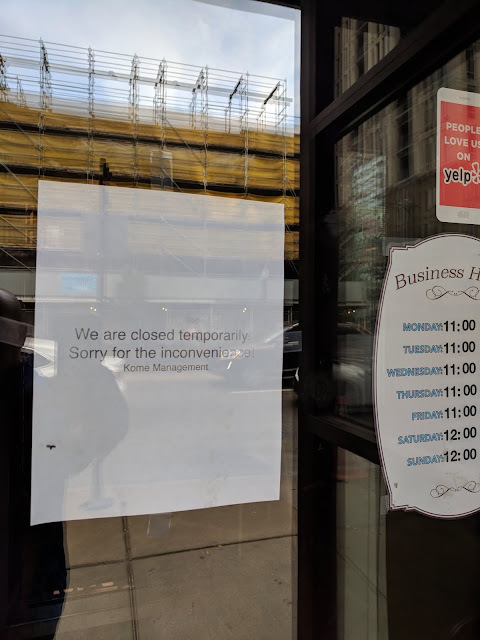 We recently were driving by the restaurant Kome Japanese Eatery (1303 S. Michigan) and noticed that all the lights were out during a prime weekend evening. Obviously that was not a good sign. We are closed temporarily. Sorry for the inconvenience. We've never been to Kome, but according to Yelp people seemed to like it (4.5 stars). As a reminder this restaurant opened about a year ago in November 2017. Does anyone have any knowledge if they're going to reopen? or maybe reconcept?